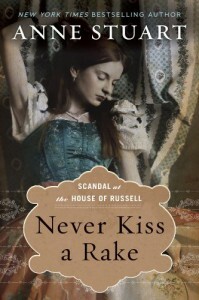 Never Kiss a Rake, is an engaging romantic suspense novel set within a historical backdrop. It starts with finding Bryony Russell and her sisters right after they were left destitute by their father's demise. The sisters weren't convinced he was an embezzler and that his death was accidental. To find proof, Bryony has set herself up as housekeeper in the Earl of Kilmartyn's home. Convinced the Earl was involved, Bryony instead finds herself falling for his rakish dark charms. Adrian Bruton, Earl of Kilmartyn, knew that his housekeeper was a spy. Instead of firing her, he decided to let her stay. The attraction was mutual and however much they fight it, they eventually give in to the forbidden. I loved this book. The tone was definitely dark, the writing deft and successfully kept the pace that built the tension so tight you didn't really know what to expect. The characters were well developed. Both Adrian and Bryony were not perfect heroes which adds uniqueness to the novel. The dialogue between Bryony and Adrian were witty, rapier sharp and the sexual tension palpable within. Adrian was not your usual gentleman hero, in fact he lives up to the title of rake. He had no compunction about seducing Bryony and toying with her initially. He thinks himself not a good man, "a liar, a cheat, a shallow, conscienceless cad." Bryony's feelings were also a dichotomy, she hated him for his trifling and his seductive ways and his probable involvement in her father's death. And yet she also could not deny that she was so very much attracted to him. The way the words were used puts emphasis on what feelings these two have for each other which is a testament to the author's talent. The ending, although somewhat happy for our couple , was still in a cliffhanger way with regards to the motives for the murder of Bryony's father. Overall this was still a great read that fans of romantic suspense should not miss.